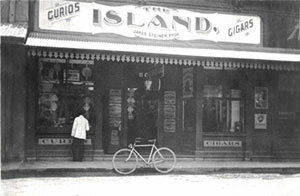 The Island Curio Store, downtown Honolulu, about 1905. A major publisher of Hawai'i postcards in the early 1900's. The following is a list of publishers of Hawaii picture postcards (standard size 3 1/2" x 5 1/2") up to about 1990. It is fairly complete and the club would welcome any verifiable additions. The only criteria is that the picture side is related in some way to Hawaii. Unrelated postcards (e.g. Santa Claus) postmarked in Hawaii have not been included. Many Hotels and Restaurants publish their own postcards. Only major Hotels and Restaurants plus Hotels and Restaurants that no longer exist have been included. The 3-letter code next to the publisher is the abbreviation assigned to that publisher by the Hawaii Postcard Club. See alphabetical list of 3-letter codes. RJB - R. J. Baker Photo, Honolulu, Hawaii. SRD - Sam R. Dowdle. HAM - Ham Radio postcards - various. HSS - Hawaii and South Seas Curio Company, Honolulu, Hawaii. WRH - William Randolph Hearst. HFH - H. F. Hill, Honolulu, Hawaii. HDC - Hilo Drug Company, Hilo, Hawaii. HPS - Honolulu Photo Supply Company, Honolulu, Hawaii. EHM - Edward H. Mitchell, San Francisco, California. NYS - New York Sunday American and Journal, New York. PMS - Pacific Mail & Steam Ship Company. MRL - M. Rieder, Los Angeles, California. ROT - The Rotograph Company, New York City, New York. SOP - (Soper) Pioneer postcards with no printer's name on. WNC - Wall Nichols Company Limited, Honolulu, Hawaii. WEH - Woman's Exchange, Honolulu, Hawaii. AGP - AeroGem Postcards, Davie, Florida. ABC - American Board of Commissioners for Foreign Missions. ACC - American Colortype, Chicago & New York. AHL - American Hawaiian Line, Honolulu, Hawaii. AMN - American Museum of Natural History. APL - American President Lines, Honolulu, Hawaii and California. ACN - Americhrome, New York. APC - Associated Printing Company, San Francisco, California. ASN - Associated Screen News Ltd, Montreal, Canada. JIA - J. I. Austen Company. AWA - Awani Press, Texas. JCB - J. C. Bardell, San Francisco, California. MBS - Max Basker & Sons, Honolulu, Hawaii. BCC - Bates Color Cards, Honolulu, Hawaii. BTA - Baxtone, Amarillo, Texas. BMH - Bishop Museum, Honolulu, Hawaii. BNB - Bishop National Bank, Honolulu, Hawaii. GJB - G. J. Boisse, Honolulu, Hawaii. BRC - Jim Brocker, Kaunakakai, Molokai, Hawaii. BSN - Brown & Shaffer, Newport News, Virginia. CAM - Camera Craft Shop, Aloha Studio, Hawaii. CPC - Canadian Pacific Cruise. CAP - Capital Engravings, Pequot Lakes, Minnesota. CVC - Cardinell-Vincent Company, San Francisco, California. CLH - Christian's Limited, Honolulu, Hawaii. CCC - Christian's Color Card Service Inc., Honolulu, Hawaii. TCL - The Creative Lion. HCC - H. S. Crocker Company Inc., San Francisco, California. HCH - H. Culman, Honolulu, Hawaii. CDH - Curio Den, Honolulu, Hawaii. CTC - Curteich-Chicago (Curt Teich & Company Inc.) Chicago, Illinois. DAH - Ron Dahlquist Photography, Paia, Maui, Hawaii. DVP - De Viona Photo, Honolulu, Hawaii. DPH - Dole Pineapple, Honolulu, Hawaii. DSL - Dollar Steamship Line. DCH - Driscoll, Honolulu, Hawaii. ETZ - ETZ photo, Honolulu, Hawaii. JSF - Jessie S. Fisher. FIP - Friends of Iolani Palace, Honolulu, Hawaii. GCR - Garraway Company, Rutherford, New Jersey. GAN - German American Novelty, Germany. HKH - Halekulani Hotel, Waikiki, Hawaii. VOH - V.O. Hammon Publishing Company, Chicago, Illinois. HGF - Harbor Graphics & Fine Printing Inc.
HAL - Hawaiian Airlines, Honolulu, Hawaii. HMC - Hawaiian Mission Children's Society, Honolulu, Hawaii. HRC - Hawaiian Resources Company Limited, Honolulu, Hawaii. HCR - Hawaii Consolidated Railway Limited, Hilo, Hawaii. HNH - Hawaii Natural History Association, Honolulu, Hawaii. HSI - Hawaiian Service Inc., Honolulu, Hawaii. RHS- Ray Helbig's Hawaiian Service, Honolulu, Hawaii. EHB - Ern Hill, Brussells, Belgium. HPH - Hilo Photo Supply Limited, Hilo, Hawaii. HYH - Hong & Yim, Honolulu, Hawaii. HPC - Honolulu Paper Company Limited, Honolulu, Hawaii. HSH - Honolulu Seaside Hotel, Hawaii. HLN - Hotel Lexington, New York City, NewYork. HBL - Hula's Bar & Lei Stand, Waikiki, Hawaii. FHC - Franz Huld Company, New York. IAL - InterArt, London, England. IHS - International Hotel Supply Company, Boston, Massachusetts. ICC - Island Curio Store (Island Curio Company), Honolulu, Hawaii. IHP - Island Heritage (Publishing), Honolulu, Hawaii. IHR - Island Holidays Resorts, Maui, Hawaii. JLA - Jondall, Los Angeles, California. KKH - Kahuna Komics, Honolulu, Hawaii. KHH - Kapiolani Hospital, Honolulu, Hawaii. KHL - Kodak Hawaii Limited (KofH), Honolulu, Hawaii. KIK - Kona Inn, Kona, Hawaii. ECK - E. C. Kropp Company, Milwaukee, Wisconsin. KSC - Krueger Specialties Company Inc., Oak Park, Illinois. KYH - Kyo-Ya Hotel, Honolulu, Hawaii. LEV - Le Vasseur Drug Company, Honolulu, Hawaii. LIB - Liberty Photo Company, Honolulu, Hawaii. LML - Libby, McNeill & Libby. LAS - Los Angeles Steamship Company, Honolulu, Hawaii. and Los Angeles, California. LES - Lesco Limited, Honolulu, Hawaii. LFL - Lum and Feher Limited, Honolulu, Hawaii. KMC - K. Maehara Camera Craft Shop, Hilo, Hawaii. MAK - Makelina Ltd., Honolulu, Hawaii. MAN - Manele Bay Hotel, Lana'i, Hawaii. MPM - Marciel Publishing, Marshall, Washington. RMT - Richard Marks Tours, Kalaupapa, Molokai, Hawaii. MCL - Master Color Laboratories, Honolulu, Hawaii. MAT- Matson Lines, Honolulu, Hawaii, and California. MSI - Matsumoto's Shave Ice, Haleiwa, Hawaii. MTT - Phil Mattes Post Card Shoppe, ?. MHM - Maui Hilton, Maui, Hawaii. MRC - Mayrose Company, Linden, New Jersey. MCN - M & Company Nachf, Berlin, Germany. MCG - McGrew Color Graphics, Kansas City, Missouri. MEC - Methodist Episcopal Church. MPC - Mid-Pacific Carnival, Honolulu, Hawaii. MCS - Mid-Pacific Curio Store, Honolulu, Hawaii. MIS - Mission House Museum, Honolulu, Hawaii. MOA - Moana Hotel, Waikiki, Hawaii. MCC - Modern Camera Center, Hilo, Hawaii. IMH - I. Morihiro, Hilo, Hawaii. EMH - Ernest Moses, Hilo, Hawaii. MSC - Moses Stationery Company Limited, Hilo, Hawaii. MSH - Movie Supply of Hawaii, Honolulu, Hawaii. NLH - Na Lei Hulu I Ka Wekiu, San Francisco, California. NPC - Newman Post Card Company, Los Angeles and San Francisco, California. DHN - D.H. Nielen, Cincinnati, Ohio. NAA - North American Airlines. NWO - Northwest Orient Airlines. OSC - Oceanic Steamship Company. PFE - Pacific Far East Line. PFC - Pacific Film Corporation, Honolulu, Hawaii. PML - Pacific Mercantile Ltd.
PNC - Pacific Novelty Company, San Francisco, California. PPH - Pacific Promotions Hawaii Inc., Honolulu, Hawaii. PAA -Pan American World Airways. PPC - Paradise Postcard Company, Honolulu, Hawaii. PMN - Peabody Museum of Natural History, Meriden, Connecticut. PGP - Petroglyph Press, Hilo, Hawaii. PAP - Pineapple Post, Honolulu, Hawaii. PIP - Pipa Mihi Studios, Honolulu, Hawaii. PHH - Pleasanton Hotel, Honolulu, Hawaii. PPN - Polynesian Prints, Nuku'alofa, Tonga. PKH - Princess Kaiulani Hotel, Waikiki, Hawaii. RPH - Radigraph Photo, Hawaii. RIC - Rainbow Island Cards, Honolulu, Hawaii. RSL - Red Star Line, Antwerp, Belgium. RAP - Rice & Perkins. MRB - Mike Roberts, Berkeley, California. RMH - Rose & Morris, Honolulu, Hawaii. IRC - Irving Rosen Color Production, Honolulu, Hawaii. RHB- Royal Hawaiian Band, Honolulu, Hawaii. RHH - Royal Hawaiian Hotel, Waikiki, Hawaii. MAS - M. A. Sheehan, Topanga, California. SWH - Sheraton Waikiki Hotel, Waikiki, Hawaii. RAS - Robert A. Siegel Auction Galleries Inc., New York City, New York. SPC - Souvenir Post Card Company, New York. SPH - Stineman Photo, Honolulu, Hawaii. HHS - H. H. Stratton, Chattanooga, Tennessee. SAC - Steinhart Aquarium, California Academy of Sciences, San Francisco, California. SCE - Scentiments by Card Shark, Honolulu Hawaii. SSB - Sterling Sales Builders Company, Honolulu, Hawaii. SSI - Sunny Scenes Inc., Winter Park, Florida. SRH - Surf Resorts, Hawaii. TCC - Tahitian Color Card, Honolulu, Hawaii. TAY - Taylor Agencies, Honolulu, Hawaii. TPL - Taylor Pacific Limited, Honolulu, Hawaii. TBI - Technor Brothers Inc., Boston Massachusetts. THI - Ern. Thill, Brussels, Belgium. TMP - Times-Mirror Printing and Binding House, Los Angeles, California. TPC - Tongg Publishing Company, Honolulu, Hawaii. RTS - Raphael Tuck and Sons, England. UAU - Underwood and Underwood, New York City, New York. UOC - Union Oil Company, California. UAL - United Air Lines. UAM - U.S. Army Musuem, Fort DeRussy, Waikiki, Hawaii. UPS - Universal Photo Studio, Honolulu, Hawaii. USP - U.S. Publications, Koeln, Germany. USC - Uris Sales Corporation, New York City, New York. UBS - USS Bowfin Submarine Museum & Park, Pearl Harbor, Hawaii. VCP - Vandercraft, Prineville, Oregon. VAV - V. A. Vetlesen, Wailuku, Maui. WTH - Waikiki Tavern, Honolulu, Hawaii. WPH - Walt's Photo, Honolulu, Hawaii. MHW - M. H. Weinberg, Honolulu, Hawaii. WCC - Wesco Color Card. WIW - Willard Inn, Waikiki, Hawaii. JJW - J. J. Williams, Honolulu, Hawaii. TWH - The Willows, Honolulu, Hawaii. EWF - Ed Wood, Forestville, California. WWD - WW Distributors Limited, Honolulu, Hawaii. YPM - Young's Peoples Missionary Movement. Verifiable additions to the above list are welcome. If you have access to a scanner, please e-mail a scan of the back and front to or fax to ..
A photocopy of the back and front of each postcard is required. Your addition(s) will be gratefully acknowledged by viewers of this website. go to Alphabetical list of 3-letter codes.